I am not one for celebrity/gossip magazines; I buy them maybe 3 or 4 times a year, usually because I am either sick or travelling by plane. But I am curious, you know. And when I read Jamie Oliver’s wife had written a children’s book, I just had to have a look, because I like the Olivers (funnily enough, I have not had the same urge to look at either Colleen McLoughlin, Katie Price or Geri Halliwell’s offerings to the children’s literature world. Oh well). The book is pretty. Too pretty. It’s like flicking through a Cath Kidston catalogue. And the illustrations are, well, a bit odd. Sometimes (often the landscapes) they are really nice, sometimes (often the characters’ faces), they are verging on the creepy. Jools Oliver’s brief was that she wanted someone who could create a wolrd similar to the one of Shirley Hughes and I guess to a certain extent she succeeded (in very loose terms). So what’s the writing like I hear you ask? There are four stories in the book, one for each season. 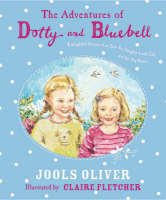 The stories follow two siblings, Bluebell and Dotty, and their next-door neighbour, Jake. Bluebell, the eldest of the two, is the good little girl and of course Dotty is the naughty little sister. Jake is always up for an adventure. The stories are old-fashioned, definitely reminiscent of the world of Enid Blyton, Dorothy Edwards and Joyce Lankaster Brisley, and there is nothing wrong with that (and that was what the author intended). The quality of writing is not great; it’s readable, but not great. Some of the writing is quite clumsy and there are a lot of phrases like “Now this was VERY exciting news indeed” and “Well you’ll never guess what Dotty did next”; see what I mean? So, it is no great success, in my humble opinion. I am sure the book has done well in the charts but that’s probably thanks to nosy people like me rather than due to its quality. I was going to kind of hide it, hoping my 3 year-old daughter would soon forget about it. But guess what? She absolutely LOVES (there is a lot of that in the book) it. So it has joined the Princess Poppy books in her little shrine. And I am slightly grateful that it is my other-half who gets to do the English bedtime stories (I do the French stories, as we are a bilingual family)! I was interested in your comments about the Jools Oliver book, and why you bought it. It is interesting that your youngster liked it. I am the new author of a children’s book for the under 8’s. It has ten stories and features a Car, a merry-go-round and lots of happy children. I hope you and perhaps others will buy my book, even if they are not sure why.